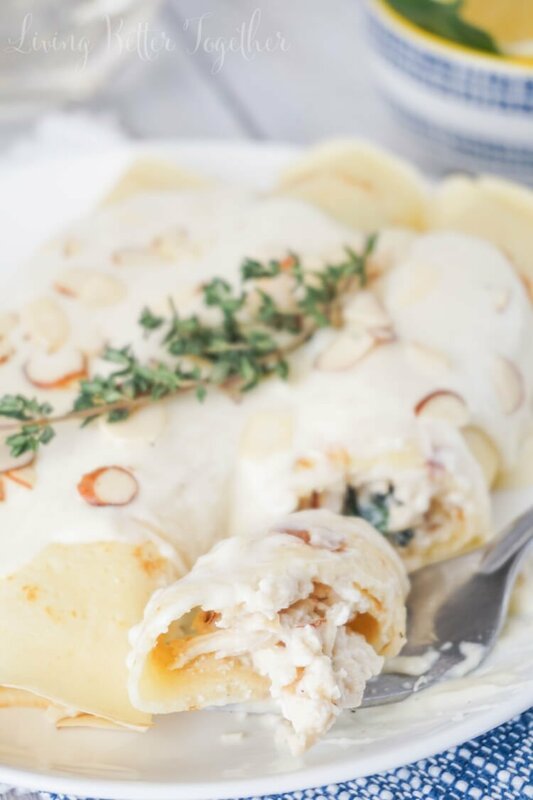 These Spinach & Chicken Crepes are soft and stuffed with lemon chicken, spinach, almonds, and ricotta and served under a thick and creamy white wine sauce. If you were to ask me what my favorite dinner dish is, I’d tell you chicken crepes. The restaurant we held our rehearsal dinner at and usually go to on my birthday has these chicken crepes that are out-of-this-world-good! They’re loaded with chicken, grapes, and almonds and served over rice pilaf with this amazing white wine sauce I could drink out of a jug! Now, I’m not much of a chef, more of a baker, obviously. But when this month’s Mystery Dish ingredients were announced, I decided to try and make my favorite dish at home. While it’s not quite the same as the dreamy recipe at the restaurant, my lemon and spinach version is still pretty great! 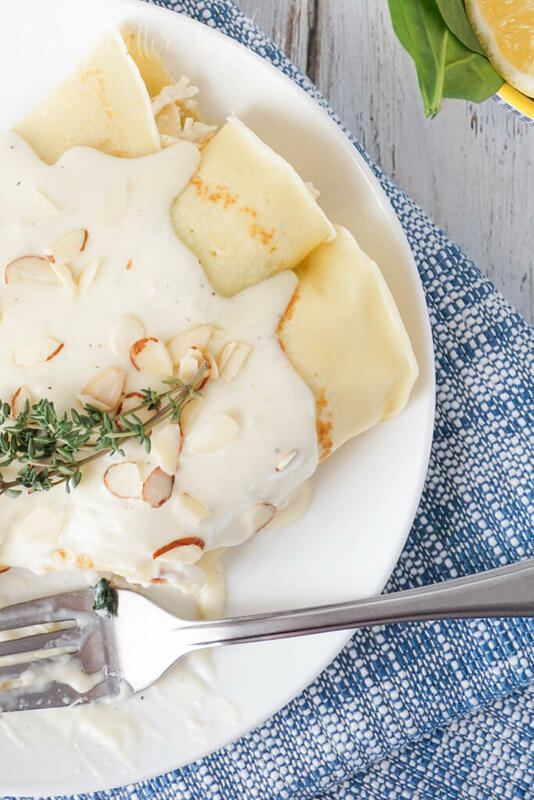 Have you ever had SAVORY crepes? I love them, and really should make more of them. I love having them filled with steak and eggs in the morning and one of my favorite restaurants ever is the Island Creperie on Anna Maria Island in Florida. Crepes are so versatile and I really think I need to eat more of them! You think so too, right? 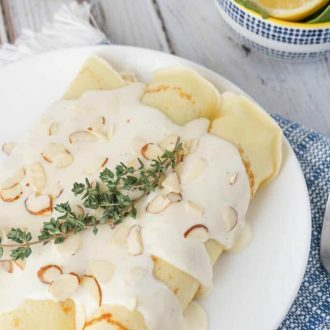 These crepes are really easy to make even if they don’t look it! The crepe batter has to sit for at least an hour, but you can make it up to 48 hours ahead of time! You can also whip up the chicken salad filing early and saute it with the spinach just before serving. 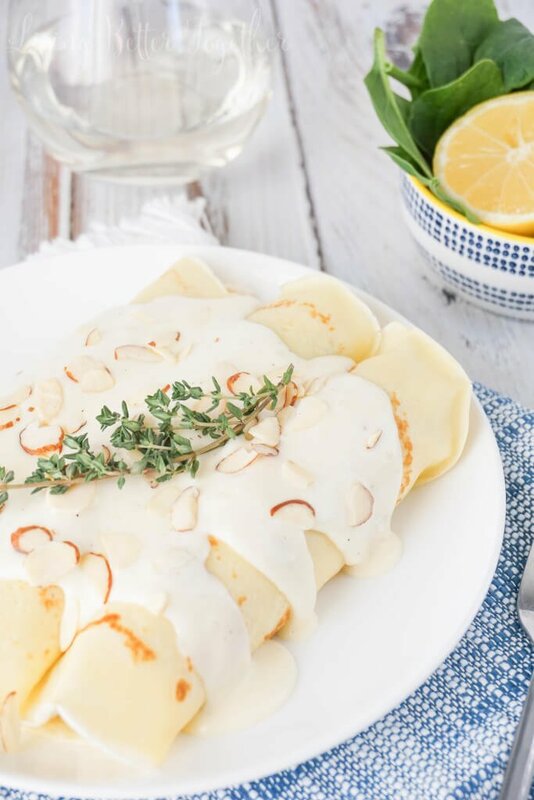 These crepes are perfect for a late brunch or dinner. The spinach and little bursts of lemon brighten up the otherwise rich dish and the almonds add the perfect amount to texture and crunch to the filling! Don’t forget to scroll down to find out what my lovely friends made with their mystery box ingredients! Once batter has set, heat a small pan and add butter. Mix together shredded chicken breast, ricotta, almonds, lemon juice, garlic powder, salt and pepper in a medium bowl, set aside. Add a little olive oil to a large pan over medium heat and toss in spinach, cooking it until it begins to wilt and turn a dark green. Add in chicken salad mixture and turn heat to low, stirring occasionally. Meanwhile, in a small saucepan, melt butter on high heat. Once butter has melted, add in white wine and cook for 30 seconds and turn heat to medium-high. Add cream, lemon juice, seasonings, and thyme to the pan and allow cream to reduce by half, about 5 minutes, stirring frequently. While sauce is simmering, assemble crepes by filling each crepe with about 1/3 cup of chicken filling and rolling. 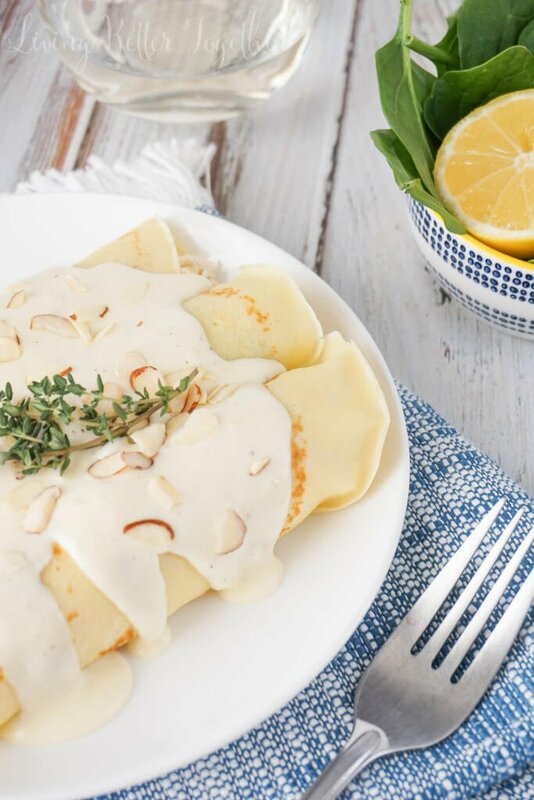 Remove sprig of thyme from sauce and pour over prepared crepes. Holy smokes, these look divine. My husband and I came back from Paris this summer and immediately invested in a crepe maker. This recipe is going to kick our usual nutella banana filling to the curb for a while. Thanks for sharing! I need a crepe maker, but I think if I bring another kitchen tool into this house my husband might kill me 😉 I did sneak in a waffle maker last month! 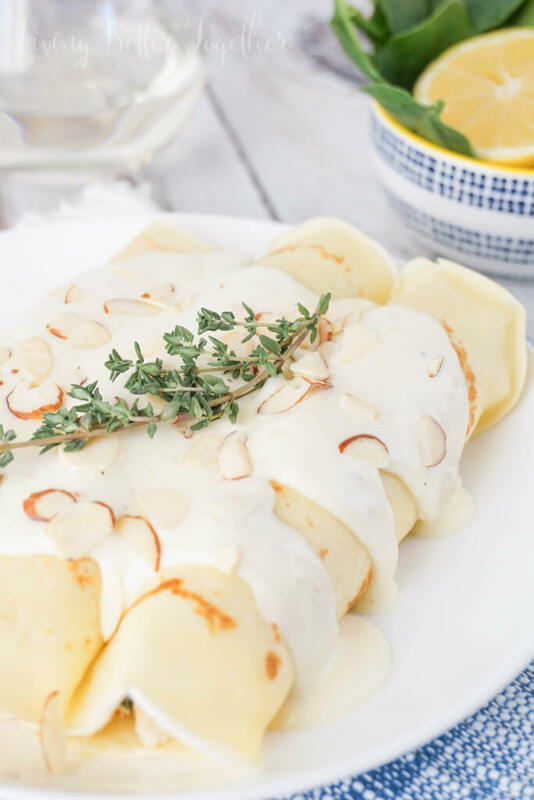 I hope you enjoy the recipe, crepes in Paris is on my bucket list! I love kitchen “toys”. Makes cooking more fun so shop away. I have shelves in my basement where I keep my appliances. I store them in the box to stack neatly. Wanting to serve 18 people, brunch. Any suggestions for preparing filling and / or sauce the day before? Hi Denise, So you can definitely make the crepe batter in advance and put it in the fridge overnight. You should be able to make the filling no problem, but I might nuke it a bit before filling the crepes since the cold filling would be less than desirable. However, sauces like this really shouldn’t be made in advance because they can break very easily when they change temperature too much, so if at all possible, definitely make the sauce the day of. 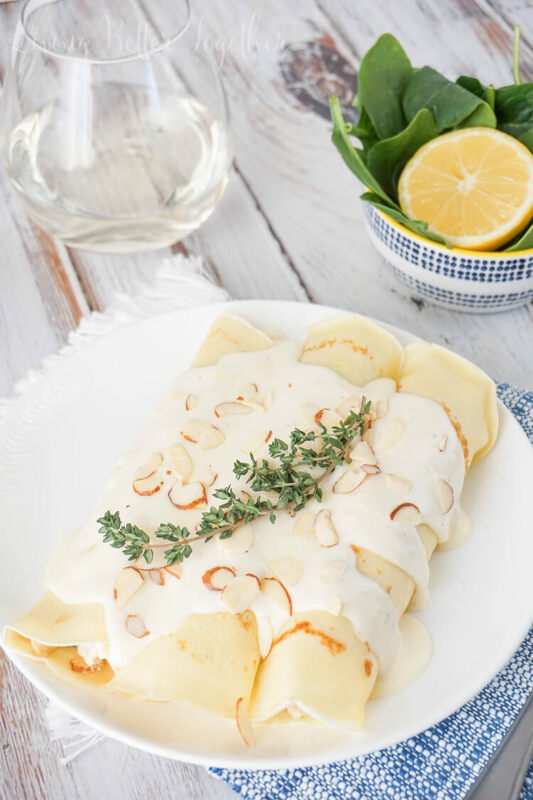 If it helps, you could even precook your crepes a day or two before, simply place sheets of wax paper between each crepe and store them in a large plastic bag in the fridge until ready to use. Pull them out the morning of to get to room temp or nuke them in the microwave for a few seconds. Enjoy! I agree about the filling but crepes store very nicely in the fridge so don’t hesitate to make ahead. They are timeconsuming to make and will save a lot of time the day of your brunch. If you are serving a fresh fruit salad, that can be made the evening before, and in fact is better when the flavors meld together. Set your tables including serving pieces the day before. I’m all about stress-free entertaining and anything you can do in advance is worthwhile.